Persimmon Branch Farm grows both White and Yellow Peaches and a number of different varities of Apples and Hachiya Persimmons. Freshly picked, locally grown vegetables are now available. Seasonal crops grown include natural asparagus, picked fresh daily! Look for our FRESH Asparagus in mid March through Easter! Our primary apple is the Heirloom Gravenstein Apple and is a delicate balance of sweet/tart and very crisp eating apple. Other apple varieties include Granny Smith, Empire, Honeycrisp, Red, Yellow, and Golden Delicious. 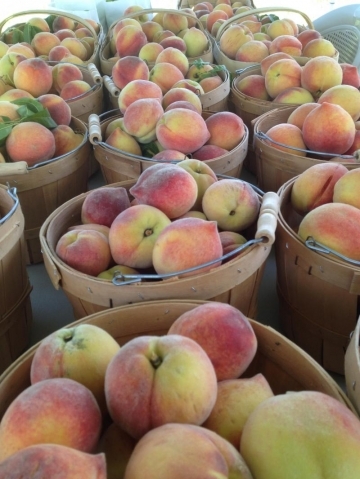 We have 17 varieties of peaches including Candor, Cresthaven, Redhaven, Harken, Ranger, Elberta, and others. White peaches grown are Blushing Star, White Lady and Snow Giant. Our peaches are super juicy and extra sweet averaging between 3/4 - 1 1/4 pound EACH last season. Locally grown peaches and apples are now available! All fruit is freshly picked for our customers. rnWe have picked our first yellow peach and have started picking our next two varieties, Harken and Redhaven! Other varieties will be ready about every three weeks. There are 17 different peaches in our orchards. Each variety has it's own flavor. All varieties are tree ripened for ultimate juiciness and taste! Our Heirloom Apple, Gravenstein is almost ready! This apple is a delicate balance of tart/sweet and extremely crispy apple. The Gravenstein is a great apple to eat of bake! Our farm is conveniently located between Lexington and Denton, just south of Thomasville. Our farm is less than 3 miles from the Denton Town Hall building. Sweet, seedless Persimmon pulp frozen and packaged in 1 and 2 qt. bags are available - limited quantities. FARM STAND NOW OPEN!!! Operating hours are Monday - Saturday 9 am - 6 pm and Sunday 12 noon -5 pm. We are now accepting all major debit/credit cards with a minimum purchase of $10.00.